Your Chance To Beat Me . . .
. . . at chess I mean, is coming up very soon. We're running our Club Championship across two Tuesdays, the 8th and 15th of May, at our excellent new home venue Woodfield Grove Tennis Club. The format will be a six-round rapid-play swiss, with rounds starting 7.30pm, 8.30pm and 9.30pm on each of the two nights. There are two prizes. First place wins free membership of the club for next year - along with a sparkling Trophy, that you get to keep for a year. The highest placed player in the second half of the field will also win free club membership for a year. We'll use estimated grades if rapid or standard ECF grades aren't available - and the games will be graded for the ECF rapid list. Our Presidente Angus French will run the event, and if you'd like to take part just drop him an email. What else? The event is free to enter, and open to Streatham & Brixton Chess Club members (it's never to late to join) as well as to our neighbours and friends from Streatham Chess Club. "The unprincipled Englishman managed in turn to worm his way into the confidence of Korchnoi, Karpov and Kasparov! – people with different nervous systems, life experience and political views. Such a skill hardly deserves imitation, but admiration – certainly!" Bonus points available for the author of these words. But frankly, I have no idea how to make a good blog post out of them. Caption competition? Guess the players? Just present the image, gallerifically? Any suggestions welcome. Normal service resumed tomorrow. Some players do it with accountant-like consistency and Sherlock Holmes levels of curiousity - whilst for others it never crosses their minds, and they couldn't care less. I mean, keep a spreadsheet of personal chess results, and analyze them statistically. I fall into the former group, and as a follow up to Jonathan's post I'll share two things that I've learnt from my stats - and how these discoveries have recently changed my play*. To begin with, I found my results as black and white are strikingly different: an average grade of 152 versus that of 171. When I noticed this discrepancy earlier this year, the gap was even larger than that - but since then I've been playing more cautiously as black, frequently seeking no more than liquidation if it's available, especially against 1.d4 or higher rated opponents. And in the background, I'm also now developing an opening repertoire as black. A relatively uncomplicated story of opening problems and expectations emerged, in other words, and I'm working on it. But, a bigger and far more complex surprise awaited me when I sliced the data by grading bands. Before I go on to try to interpret what I found, here are the details. Firstly, I found that my average performance against players graded less than 160, is 162. Since I have a grade of 160, this is pretty much as you might expect. Secondly, I found my average performance against players graded 170 and above is rather more impressive - at 176. These two facts of course now imply a third; that against players rated from 160 to 169, my average performance falls through the floor. And this is indeed the case; it's 136. Colour is not especially responsible either - with black my average is 131 versus 160s, with white it's 146 versus 160s. And to top it off, in these last twenty months I've never actually beaten an opponent in the 160 grading band - whilst against the stronger, 170+ players, I've scored +2 =6 -2. So, how to explain that I do so much worse against 160s? I had some ideas but wasn't sure, so also discussed it with a few friends. One suggestion was that us 160s are different: we're talented but lazy, or really 190s but drink too much, or we've a wacky style that bamboozles weaker opponents, but never catapults us over 170, but that is rather good against Tom Chivers . . . Now I rather doubt all this stuff, but it did get me thinking on the nature of being a 160. In fact, I realised, being a 160 is something I know rather a lot about, since I've been one since I was seventeen. And it's also something I think about now and again, usually along the lines of: why I am wedged at this level? Now that kind of thought is probably quite useful against 170+ players, because it reminds me to be vigilant and respectful. But sat opposite a fellow 160, that kind of thought goes somewhere else instead. I start thinking of the game as a potential symbol of improvement: if I start winning these, maybe next season I'll be over 170. And then I start thinking: of course, someone over 170 should mop up against a 160, and that could be me next season. And finally it all boils down to: time to wipe this one off the board! - and a few mad moves later, I'm blundering material, and have lost to another 160. So, what can we learn from chess statistics? It seems - to me - rather a lot. I've provided two examples from my own findings - firstly and simply, I am not good with black. Secondly and more elaborately, that in trying to prove to myself I'm better than the average 160, I transform myself into the worst 160 ever. Now of course comes the more difficult part: factoring back into my play these findings. Maybe I've started already - I did after all draw as black against a 162 on Monday. Or maybe - who knows - I'll be in the 150s next season, and cured that way of such pretensions and problems? One way or another, I'll continue to monitor any personal chess changes. Using, of course, statistics. * The statistics go back twenty months - to when I came back to chess, in other words, after a couple of years away. Before that I kept no record. Last Tuesday evening we took on Redhill at home in the Surrey League. We ended the evening winning a tight match 4.5 - 3.5, although that’s no particular thanks to me since I only managed a draw. My own result shouldn’t have been surprising. It's now three months, and fourteen attempts, since I last notched up a full point. At the head of today's column is the final position of my most recent - and that's using 'recent' in a very loose sense - win. I just wanted to remind myself there was a day when I actually could beat other people at chess. Is this run of form a club record? It’s certainly a personal worst. so it's time to come up with a conspiracy theory. Every Saturday the Guardian runs a column called ‘Bad Science’. This week, Ben Goldacre wrote about randomness and how bad human beings are at identifying it. At this point the club moved from the old venue at the Priory Arms to our new home at the tennis club. D D L L D L D L D D D L D D.
how do they get to all those other venues where my results have been equally dismal? The other night I was flicking through Nigel Davies' book The Dynamic Reti, with which Jonathan has taken issue on one or two occasions. It's not such a bad book in some ways and I've always been attracted to the Reti: it's such a versatile opening. Not quite so versatile, though, as some of those against whom it is played, to judge from the ninth of Davies' illustrative games (pp. 23-26). This begins 1.Nf3 d5 2.c4 e6 3.g3 Nf6 4.Bg2 dxc4 5.Qc2 Nbd7 which Davies commends: "a logical move, continuing his development". Which development continues - in more ways than one - as the game proceeds: 6.Na3 Bxa3 7.bxa3 Nb6 8.Ne5 Ng4 9.Nxg4 Qd4 10.Bb2 Qxg4 11.h3 Qg5 12.h4 Qh6. Now Davies comments: "Black must protect the g7 pawn, but this has resulted in her queen going way offside". An uncontroversial observation, taken on its own. But hang on a minute - back at move five, wasn't the player of the Black pieces apparently male? Alec Holden is 100 today and has made headlines after winning £25,000 from a bookmaker after placing a £100 bet with them a few years ago that he would make it to 100 (if you think about it, a bet which, if lost, hardly matters). Asked the inevitable questions about how he accounts for his longevity ... one of his answers was that he plays a game of chess every day and still runs a club. He is celebrating his birthday at a party later today and he made a point of mentioning that he would be taking his chess set with him. He also mentionned porridge and breathing as being important, but can you really believe that? Whilst it was nice to see chess books given a medium-length review in the normal books section of a serious national paper this Saturday, it seemed rather a shame to me the review was framed in terms of madness - and only just daring to venture towards a limp and obvious punchline: "Just because there are some mad chess players doesn't mean all chess players are mad." One hardly sees this with other reviews. Remarks on art exhibitions, for instance, rarely conclude: "This is one artist who won't be slicing an ear off!" And it's not typical to read of novelists: "This one, at least, seems unlikely to ECT his memory to bits - and then take a shut gun to the rest." Or if we move from the review section, then we don't find the sport pages, for instance, dominated by the question: "Does supporting a football team make you a chav?" And so on. Chess is more treated like some dangerous hallucinogenic, than the intriguing mixture of fight-art-science that it in fact is. Why? 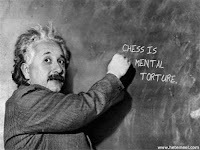 And why is there so little public discourse point-blank in praise of chess? Why is the public discourse there is, framed in terms of stereotypes like the above? Or alternatively, when it is positive, does it semi-apologetically try to utilize chess in terms of the rest of life - for example, its educational benefits? Why so little of the intrinsic attractions of the game? Or is it just like this in the UK? Or am I unaware the public praise that does exist? Blessed be the memory of him who gave the world this immortal game. For the price of a taxicab ride or a visit to the cinema, you may, thanks to that unknown benefactor, possess a world of illimitable adventures. When Alice passed through the Looking Glass into Wonderland, she did not more completely leave the common day behind than when you sit down before the chessboard with a stout foe before you and pass out into this magic realm of bloodless combat. I have heard unhappy people say that it is "dull." Dull, my dear sir or madam? Why, there is no excitement on this earth comparable with this kingly game. I have had moments at Lord's, I admit, and at the Oval. But here is a game which is all such moments, where you are up to the eyes in plots and ambuscades all the time, and the fellow in front of you is up to his eyes in them, too. What agonies as you watch his glance wandering over the board. Does he suspect that trap? Does he see the full meaning of that offer of the knight which seems so tempting? It is medicine for the sick mind or the anxious spirit. We need a means of escape from the infinite, from the maze of this incalculable life, from the burden and the mystery of a world where all things "go contrairy," as Mrs. Gummidge used to say. Some people find the escape in novels that move faithfully to that happy ending which the tangled skein of life denies us. Some find it in hobbies where the mind is at peace in watching processes that are controllable and results that with patience are assured. But in the midst of this infinity I know no finite world so complete and satisfying as that I enter when I take down the chessmen and marshal my knights and squires on the chequered field. It is then I am truly happy. I have closed the door on the infinite and inexplicable and have come into a kingdom where justice reigns, where cause and effect follow "as the night the day," and where, come victory or come defeat, the sky is always clear and the joy unsullied. from one of the early Arabian manuscripts called the Yawakit ul Mawakit in the collection Baron Hammer Purgstall at Vienna. The chess player is ever absorbed in his chess and full of care, swearing false oaths and making many vain excuses, one who careth only for himself and angereth his Maker. 'Tis the game of him who keepeth the fast only when he is hungry, of the official who is in disgrace, of the drunkard till he recovereth from his drunkenness, and in the Yatimat ul Dehr it is said, Abul Casim al Kesrawi hated chess, and constantly abused it, saying, you never see a chess player rich who is not a sordid miser, nor hear a squabbling that is not on a question of the chess board. And yields us when we need them most, companions in our loneliness. Mmm, is that better? I don't know. Can you do better . . . ? An Exceptionally Rude, Ignorant, Caucasian Peasant . . . Ever since Nigel Short was sacked from his weekly Telegraph column, my Sundays have never been quite the same. They're so much more - what's the word - peaceful? Polite? Unprovoked? And if - like me - you miss all those pointed remarks and scathing polemics, you'll be pleased to learn Short hasn't altogether stopped hacking away at his keyboard, as he once hacked away at the kings of the chess elite. I met Petrosian once. He behaved disgracefully. Full stop. Unfortunately that will always be my memory of him. Davolni's vituperative "All these comments do not make you a better player. Plus some it is still a big question whether or not you fully deserved the win." displays an extraodinary incapacity for reasoned argument. I never claimed that saying Petrosian was a boorish Armenian peasant makes me a better player. It obviously doesn't . Nor did I claim that I deserved to win. On the contrary, the text he quotes indicates exactly how lucky I considered myself to be. Whether I was lucky or not does not, however, excuse Petrosian's exceptionally poor manners - amongst the worst I have witnessed in 34 years of tournament chess and particularly unbecoming for a former World Champion. Remind you of something? Perhaps a Short article from The Sunday Telegraph in 2004, in which he wrote: "I have never succeeded in thinking of Petrosian as being anything other than an exceptionally rude, ignorant, Caucasian peasant" - ? Ah! Happy days are here again . . . Yesterday I published the top 10 of an old FIDE rating list - from 1991 as it turned out. "It is interesting to speculate how the list will look in ten years time. Maybe one or two of the participants in the World under-18 and under-16 Championships in Guarapuava, Brazil will make an appearance. The latter event was a great success for 15-year-old Dharshan Kumaran of Harrow who scored 8/11, ahead of Onikshuk (USSR), 7.5 and Almasi (Hungary) 7. Dharsan thus become [sic] the first British junior to win two world titles, having won the World under-18 [I assume this is a typo - JB] Boys' Championship in 1988. The World under-18 Boys' Championship was dominated by the Soviet Union who took the top three places (1st Kramnik 8.5, 2nd = Sakayev, Alexandrosov 8). Strisak of Yugoslavia won the under 18-girls with 8.5 while Kurtidze and Kadimova (both USSR) won the under-16 girls." Of course "in ten years time" then means six years ago now. Darshan Kumaran, I recall, stopped playing chess but I can't remember when or why. Of the others, the name of Kramnik remains vaguely familiar today and I think I've heard of Almasi and Onikshuk too (although I didn't think there was the 'k' in the middle of the latter's name). I'm fairly sure none of the other names have ever registered on my radar. So, does anybody know anything about any of these people and how things turned out for them? ... but which was the year? Unlike Kasparov (“I don't use Aeroflot. I don't eat or drink when flying. It might sound like paranoia, but it's better to be paranoid than dead”) I’ve not put much thought into how I might die. However, I’m fairly sure that ‘while playing chess’ would not figure highly in any list of desirable options. I suspect going to heaven with a head brim full of variations, missed opportunities and self recrimination would be much like Douglas Adams’ expectations of travelling the same journey with a headache - “I’d be all cross and wouldn’t enjoy it”. Happily the odds appear to be in my favour. Snuffing it at the board appears to be a very rare activity. To date I’ve only come across one account of a player actually dying during play, and that’s 80 years old. Gilmour Wilson was a talented American player who had come to Europe to challenge the strongest players of his time. Not much is known about him so it’s hard to say quite how good he was. 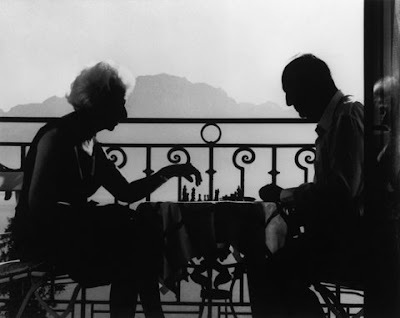 While it’s true he’d attracted descriptions such as “a second Capablanca”, even in those days such labels probably had more to do with impressing the reader than any objective truth. Wilson’s opponent on that inauspicious day was Dr. Savaronoff, a Russian émigré who had once acted as a second to Lasker. After Savaronoff disappeared following the Russian revolution it was widely believed he’d been killed by the Bolsheviks but he resurfaced in London in the early 1920s. Apparently he’d experienced three years of extreme hardship in Siberia before being able to escape abroad. Wilson repeatedly challenged Savaronoff who always carefully sidestepped any encounter. In truth the former Russian Champion was a broken man (a “semi-invalid” according to a contemporary source) and knew he hadn’t a chance against his upstart adversary. Fatefully, he agreed to a contest when newspapers began to draw attention to his “unsportsman-like refusal” to meet the American. A description of the table on which they were to play - “The top of it was exquisite, inlaid with squares of silver and black to represent a chessboard” – survives but otherwise most details of the match are now lost in the mists of time. Virtually the only thing we know is that it was to be played at Savaronoff’s own home. Presumably Wilson agreed to this concession in the light of the older man’s physical health problems and his own desire to play the match in almost any circumstances. It was while playing his third move that Wilson suddenly collapsed and died of a suspected heart attack. One account even suggests he still had his King’s Bishop grasped tightly in his hand when he arrived at the mortuary. Suspicions aroused by the unusual circumstances of Wilson’s demise were confirmed when a post-mortem revealed his heart, if not the rest of him, was in perfect health. Poisoning was also swiftly ruled out but the precise cause of death remained a mystery until a private detective from Belgium began to investigate as part of broader investigation into a world wide conspiracy. Monsieur Poirot proved the American had indeed been murdered – by his host. The board, it seems, had been wired to the mains in such a way that when Wilson played 3. Bb5 he completed a circuit and electrocuted himself. OK, time to confess the not particularly surprising truth. This is all fiction. Wilson, Savaronoff and of course Poirot are all figments of Agatha Christie’s imagination. This particular story is a sub-plot from her book, “The Big Four”. Still, let it be a lesson to you. Sticking to a predictable opening repertoire can have fatal consequences. It started with a few fluttering glances. Soon I was naïvely making moves. They all went wrong at first - but such was my selfless infatuation, even the correction of my humiliation proved a form of delight. Slowly, things started to make sense. My eyes had been dazzled by a golden glowing glitter: yet, I soon realised they had barely opened. As they slowly widened, painfully at first, then wilfully, I perceived a rich, broad, landscape, so strange and new, dotted with all manner of once-impossible creatures and rare gems. The most magnificent, mountainous peaks were - I sensed - shrouded in mist, and miles beyond the rolling horizon that even a lowly creature, such as I, could perceive remotely. But even so - I began to put a foot right, tentatively, here and there. And so, I'm in love. With, the world of . . . chess studies. And this is no ordinary love, since unlike with pasties and beer, I'm willing to share too. Which brings me to the diagram: a fairly elementary study to understand (by F. Richter, Suomen Shakki, 1953) where it's white to play and win. You can click it to embiggen if you like, but be warned. If you get it right, you're likely to hurdle over your monitor in pure joy, yodelling the lyrics of The Beatles' happiest song; Here Comes The Sun! PS. Like most good, natural forms of love, you can even get paid for it. How To Annotate A Fine Victory . . . So, you win one of the UK's most prestigious Opens, ahead of several Grandmasters, scalping a pair of titled players in the process - and the tournament organisers ask you to write up your games for their website. How do you do it? I enjoyed three cans of Tennent's on the way down, mostly to ease the pain of being inches away from Graeme Kafka's one working speaker, however a rather loud one, but at the board I would soon discover that I had the "flow" this weekend, so my slight fuzzy feeling should not worry me too much. With the black pieces I soon equalised, but my opponent played the middle game well, and as our pawn chains locked the centre efficiently, the a-file was my only hope. he wrote of round 1. You can read the rest here, and I don't think it spoils anything to let you know the inevitable punch-line: "The trophy is now on display at the Sandy Bells pub." Thanks to Tryfon Gavriel for the tip-off on this one. "So Pretty, It Had To Be Played . . ."
When you sit down for your game, and then spot that the opposing team has a Grandmaster playing on board three - you know already you're in for a night of tough chess. And so it proved for Streatham & Brixton's First Team in the match against Cavendish I, in London League Division One on Thursday, that ended 3-9. But one of our three points was, at least, both a major upset and magnificent game. On board 5, Robin Haldane beat Matthew Piper (2290 Elo/193 ECF) with the black pieces and in a sumptuous sacrificial style. The fireworks started to go bang in the diagram position, and you can play through the whole game below the rest of this update. Meanwhile on Tuesday, our Second Team in the Croydon League scored a thumping 3½-½ win against South Norwood. They now lead Division 2 - and could win it tonight by beating Crystal Palace 2. Good luck chaps. After two defeats on the trot, our second team in the London League have also recovered a bit out of their bounce, by beating Beckenham & Charlton 6½-3½. And they also currently lead Hackney 2 by 4½ to 2½, with three games adjourned from that one. Finally, the Stoneleigh Trophy has concluded this year. In our last game of the season we beat Wallington & Carshalton 4½-3½ to give us a chance of victory. But alas for us, Surbiton drew their final match, to edge ahead of us on game points and clinch the title. Congratulations to them, of course. Now here's what you've been waiting for. Bobby Fischer once claimed to have been tortured in a Pasadena jail house. Today's Observer reports Kasparov was arrested in Moscow yesterday. Perhaps life does imitate chess after all. I promised a few posts ago that I'd show you a couple of games in which my inability to play well when it really matters would be illustrated. So here's two, played with different colours, nearly a decade apart, in places separated by three hundred miles. In some ways they're very different as games too, but they're both disasters that particularly stick in my mind. One, against Dauber, was from a final round game with a lot of prize money available, of which I won none - which, as I was a postgraduate student at the time, was particularly hard to take. Even as I write, in fact, two other instances of final-round failure have returned to my memory (three, in fact, though one of them was a fifteen-minute game, played last summer, of which I do not have the score). Perhaps I shall post them at a later date: but this game was probably the hardest to take, not least because while I played abjectly in at least one of the other games, in this one I played well for much of it and retained a sizeable advantage until quite near the end. But painfully and inevitably, it just slipped away at the death. The other, against Tippleston, was from the penultimate round and wasn't played in the top section of the tournament. It was not long after I returned to chess after several years away from the board and I wasn't brave enough to take on the top players when I was still eligible for the under-170s. But had I won I would have been strong favourite for the first prize - two hundred quid, from memory - in the last round with the white pieces and a dozen or so BCF points (as they then were) over my opponent. Presumably I'd have fouled it up - right now you'd have been reading about that game rather than this one. But this one, anyway, didn't slip away slowly. It went suddenly, just like that, one great chance missed and I was gone. I played well in both tournaments, something not true of every competition in which I've had a chance of finishing among the prizes. To me, the word deserve doesn't mean much in sport. It usually signifies an attempt to explain why your side should have won a game that in fact they lost. But I do understand the feeling that you got nothing and deserved nothing, that I'd got away with it for too long, that I'd been riding my luck and frankly if I messed up at the end I had it coming. This wasn't true in either of these instances. Not in either tournament and not in either game. Because what the games also have in common is that in each instance I had a clear, tactical win at some stage of the proceedings. See if you can spot both, without using a computer*. The Dauber win I knew nothing about until I read a newsletter weeks after the game in which it was pointed out: but the other win, Tippleston pointed out to me just after the game. Or rather, he was about to point it out but as soon as he said I'd missed a win I realised what it was. He had, in fact, considered resigning but thought he'd wait and see. A wise move in most circumstances and certainly in these. It would have been a fine finish too, the best I'd ever have played - and if, playing it through on a computer now, I can also see that I had played more than a little unsoundly and that White had already missed at least one chance of victory, it doesn't lessen my sense of regret. Nor does the passage of time. Not even fifteen years. Not completely. Nowadays of course the computer will show us the chances we missed as soon as we get home. But at home I also have my scorebooks, containing all the serious games (at least at normal time limits) that I've played since I made my competitive debut at the Hitchin Open nearly thirty years ago. Sometimes I think about playing through a few more of my big-game losses just to see if and how I could have won. And then I decide that I'd really rather not know. We've been thinking about chess books recently. A few days ago I suggested that sometimes books leave out important lines on a somewhat arbitrary basis. Justin gave another example of this within a longer post discussing whether or not authors and certain publishers put as much effort into their work as we might expect. Again I'm looking at Nigel Davies' The Dynamic Reti (Everyman published 2004) although this time I'm comparing it with Ray Keene's Flank Openings (BCM - 4th edition published1988). Both books give the game Smyslov - Ader Hausman, Tel Aviv Olympiad 1964 in full - although curiously Davies calls Black Hausman and Keene reckons it's Ader. The comments in red are those given by Keene. Those in blue are from Davies. It is not possible to compare the books this early because they give differing move orders. Keene quotes what acutally happened, Davies standardises the move order with the aim of easing the learning process. Suggests … Qb6 is better and gives analysis. Davies lists the 1979 edition of Keene's book in his bibliography. Whether that version contains the analysis as listed above I cannot say but I'd be suprised if it didn't. Presumably Davies was referring to reading chess books rather than writing them. If, like me, you spent a lazy Easter with your feet up in front of a TV back at your family home, the bad news is you're probably not a chess genius, and never will be. That's according to a New Scientist article about genius, posted at Matt Dowling's Ontogeny blog, which concludes whilst some talent is required - which also helps to rule me out - it's mostly drive and hard work that'll do it. Studies of chess masters . . . usually find their IQs to be above average, typically in the 115 to 130 range, where some 14 per cent of the population reside - impressive enough, but hardly as rarefied as their achievements and abilities. So what do elite performers attain through all [their] deliberate practice and sensitive mentoring? What makes a genius? The crème de la crème appear to develop several important cognitive skills. The first, called "chunking", is the ability to group details and concepts into easily remembered patterns. 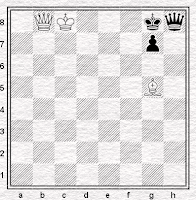 Chess provides the classic illustration. Show a chess master a game in progress for just 5 seconds and they will memorise the board so well that they can recreate most of it - 20 pieces or more - an hour later. A novice will be able to place just four or five pieces. - although the whole thing is certainly worth a read. 1 d4 d5 2 c4 c6 3 Nc3 Nf6 4 Nf3 e6 5 Bg5 dxc4 6 e4 b5 7 a4 Bb7 8 e5 h6 9 Bh4 g5 10 exf6 gxh4 11 Ne5 Qxf6. This sequence - and indeed this position - has occurred a number of times. It is discussed on page 124 of Glenn Flear's book starting out: slav and semi-slav (Everyman, 2005) with Flear selecting Azmaiparashvili-Chernin, Neum (rapid) 2000 as his illustrative game. 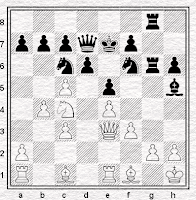 Flear doesn't like Black's eleventh move much, marking it as dubious and preferring 11...Nd7. He may or may not be correct in that judgement, but there are reasons for wondering how rigorous he was in making it: which question we shall be examining later in this piece. But it's not the only question I have about the book, which seems to me to stand as a good example of what's wrong with Everyman books in general. I say "in general" because I don't believe that this is a particularly shoddy book, nor that Flear is a particularly shoddy author. Far from it. I have several books of his and none are without merit, including this one. It just happens to be one I've been reading recently and therefore happens to be the subject of this piece. But if it's not a particularly poor production then that itself would say something uncomplimentary about Everyman's standards, because the number of errors which I have come across - without particularly looking for them - is, to my mind, unacceptably high. We are mostly talking about errors of language and production, i.e. things that should be picked up at the copy-editing stage: I list those which I have spotted below. I repeat that I didn't go looking for them. They were easy to spot. They drew attention to themselves. 1. Page 37: once knows the basic theory there isn't much need to update it very often. Should presumably be once one knows? 2. Page 42: how Black could diffuse the attack. Should be defuse, a common error. 3. Page 58: Getting involved in tactical mÍ IÈes when behind in development. Should be melées. 4. Page 70: if White's tries the other two approaches. Should be if White tries. 5. Page 82: Shirov prefers 11 Rc1! (see the introductory notes). This move is not, in fact, mentioned in the introductory notes. 6. Page 141: Now White has to decide on his plan of action Full stop omitted. 7. Pages 219-220: (remember that the immediate 5 Bg5 can be met by the sharp 5...dxc4) Remember should start with a capital letter and there should be a full stop after 5...dxc4. 8. Page 225: ensures the recuperation of the c-pawn. Should be recovery. Is this not a few too many? Everyman may argue that it is not, or that it doesn't matter because the most important thing is the chess content of the book. No doubt it is, but if a publisher believes that this number (or nature) of errors is tolerable then I think I would like them to say so openly. "We don't think this matters, stop complaining." But I do think it matters and I think it's important to say so, if only because unless we are prepared to complain about standards then those standards will never rise. Moreover, there is not necessarily a total separation between the chess content and the other elements - like language and production values - that are involved in the creation of the book. This is because in the production of any book you need people to look for authorial mistakes and oversights. People make mistakes, so other people are required to detect and correct them. But if the publisher is rushed, lax or negligent - look at it whichever way you wish - in performing the job of oversight where errors of language or production are concerned, then there's no convincing reason to believe that the job will be performed better where the chess content is concerned. Moreover, the very fact of shoddiness in the production of the book will lead us, the readers, to lose confidence in the rigour and reliability of the author's judgements. "If they couldn't be bothered to check that", we will inevitably think", "then what else will they have missed?" This brings us back - almost - to the sequence I mentioned at the beginning of the piece. But before we get there, I'd like briefly to mention an odd omission in the chapter on the Exchange Variation. On page 80 Flear discusses the line 1 d4 d5 2 c4 c6 3 cxd5 cxd5 4 Nc3 Nf6 5 Nf3 Nc6 6 Bf4 a6 at which point he gives two alternatives: 7 Ne5 and 7 e3. He does not mention 7 Rc1. Which is curious, not just because that move is considered strongest by some authorities, but because among those authorities is a 2003 Everyman book called the ...a6 Slav, whose author describes 7 Rc1 as "the most challenging". That author was, of course, Glenn Flear. If it was "the most challenging" so recently - not a move that could plausibly be seen as a sideline - why leave it out now? I note that the blurb claims that the Slav and Semi-Slav "have provided the battleground for thousands of exciting encounters between the world's chess elite", the accuracy of which claim (thousands?) I am inclined to doubt. Accuracy does not appear to be predominant among the qualities to which this book aspires. Is it, in this respect, typical or atypical of the genre? How much can we expect from this sort of book? We perhaps cannot expect it to be comprehensive. There are such books, but they are rare and noteworthy and we cannot expect every book to be among the best. We can surely also assume that in time some of its judgements will be found wanting. Opening theory changes and if this were not so we would not buy so many books. and now Flear, observing that "11...c5 leads to crazy complications", describes the game move (11...Bb7) as "the relatively quiet option". (Indeed, Black swiftly found himself in a satisfactory position.) 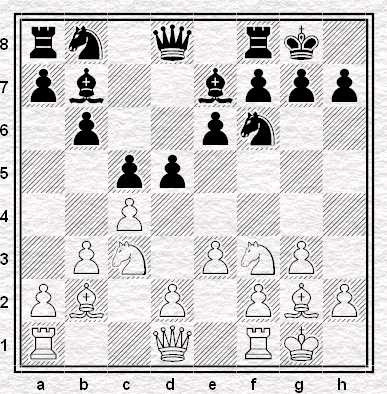 Which is interesting, because the position after Black's eleventh move is exactly the same as the diagram position. The position after his apparently dubious eleventh move in the game which Flear gives immediately preceding this one. A point, a transposition, which apparently escapes Flear completely. It does not invalidate his opinion that Chernin had a better alternative on move eleven, but it does beg the question as to why Flear didn't notice that he reaches the same position, by different move-orders, in consecutive games. So we are surely entitled to ask - if he didn't see that, exactly how hard was he looking? "I think of chess as a pain in the neck because the nearer you get to being any good, the more you realise you're never going to be any good! I have enough trouble with snooker let alone trying to delve into something like chess." I don’t know if Anand enjoys chocolate eggs but if he does he’ll be munching away this Easter happy in the knowledge he’s just be declared the highest rated chess player in the world. Again. Anand, won the recent Linares tournament and, perhaps helped by Topalov’s rather disastrous performance, gained sufficient rating points for the chess press to work out he’d be declared world number one in the new rating list that was due out at the end of March. The only problem was that when the list was eventually published, Anand was still in second place. It turns out that Linares finished after the end of February deadline for results to count in the new list. A slightly strange decision you might have thought. At least it seems odd to me that the governing body of a professional sporting organisation is going out of its way to avoid keeping its rating system as up to date as possible. However, rules are rules and should apply equally to everybody. If that leaves Topalov at world number one then so be it. Hard luck Vishy. 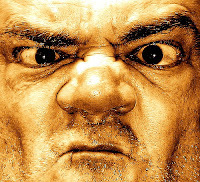 Unfortunately for FIDE, those more cynical than your humble correspondent immediately began to kick up a fuss. True, they said, Linares did finish after the deadline but that’s never stopped it being counted before. Alas for FIDE, the agitators could also point to events that ended after Linares but were included nevertheless. It is not for me to speculate on exactly what FIDE thought they were doing or what they hoped to achieve. I shall merely reflect on IM Malcolm Pein’s recent statement in the Daily Telegraph that Topalov is the “darling” of FIDE officials. In any event, FIDE finally relented and included the Linares results so Vishy Anand is officially world number one after all. The only question that remains is whether our game’s governing body might try to restore its credibility by attempting to organise a night of vigorous alcoholic drinking inside a brewery. I fear it might be beyond them. For a while now, I’ve been highly suspicious about the usefulness of chess books for the average club player (i.e. me) – and that goes double for books on openings. Nigel Davies’ “The Dynamic Reti” (Everyman Chess) is a typical example. Davies’ main line here is 9. … Nc6 and after 10. cxd5 Nxd5, 11. 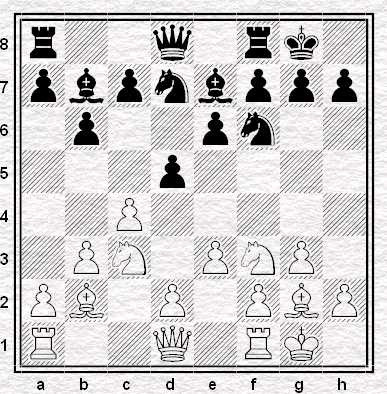 Nxd5 Qxd5 White can get some initiative based around the exposed position of Black’s Queen. If Black takes back on d5 with the pawn (with or without an exchange of Knights) White can play d2-d4 when Black will end up with hanging pawns on c5 and d5 or an isolated pawn on d5. To avoid this Davies considers 9. 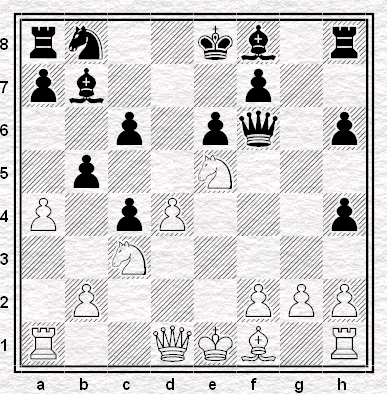 … dxc4, 10. bxc4 Nc6 which avoids the weaknesses at the cost of allowing White a central pawn majority. He also allocates a brief note to 9. … d4?! which is less good than making the pawn advance without fianchettoing the Queen’s Bishop. All well and good but my first thought when looking at this line was, “what about 9. … Nbd7”. Black develops the Knight without blocking the long diagonal and so can always recapture on d5 with the Bishop. This seems like a very sensible way to play to me but Davies doesn’t mention it at all. This position is very similar to the first. 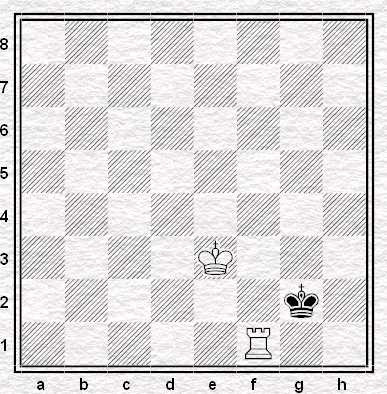 The only difference here is that Black has played … Nbd7 but omitted … c5. This is also a common line in the Reti and in fact was reached in the famous game 24 of the Kasparov – Karpov Seville world championship match. Karpov played 9. … Ne4 here. Davies analyses this game and also looks at 9. … Nc5 and 9. … a5 but again doesn’t even consider 9. … c5 which transposes into the line I mention above. Evidently I’m not the only one that thinks combining … Nbd7 with … c5 is a good idea. Over the last year I’ve faced that variation four times during Internet and Club games – but not once has anyone played the lines that Davies suggests. Ray Keene’s Flank Openings is not much better. He also gives more attention to other lines but does at least give snippets of two games in this troublesome (for me at least) line. 9. … Nbd7, 10. d3 Rc8, 10. Qe2 Qc7, 12. e4 d4, 13. Nb1?! and Black went on to win in 36 moves. 9. Nbd7, 10. d3 Qc7, 11. Qe2 Bc6! ?, 12. Rfd1 Qb7, 13. d4 Rfd8, 14. Ne5?! 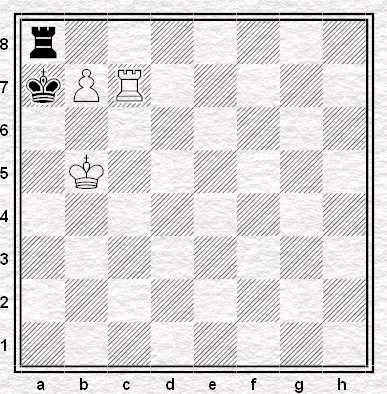 and again Black won on move 36. Keene suggests 14. cxd5 instead but doesn’t give any further analysis or assess the position. Black seems to be doing fine when he mixes … c5 and … Nbd7 together. To my eyes it seems a much more obvious way to play than blocking the long diagonal with … Nc6. In any event, the players I come up against – typically within the range 120-150 BCF although sometimes a little more or a little less – favour this set up over any other. So why does Davies ignore it entirely why Keene only gives it a cursory glance? Oh and one more question, what’s a good plan against it? Can your knight collect all the eggs, without once hopping on an empty square? The first link above has a clickable board for you to find out. I managed it after several attempts - but through blind luck rather than visualisation ability, I have to confess. That's it from me for a week, although in the mean-time you might well be treated to the odd post or two from Justin and Jonathan. Do you ever find yourself in the middle of a game and notice that your heart is racing and your palms are sweaty? It happens to me every now and then ... especially in games that are really important to me. I've noticed that the last couple of games I've played, that when I spot a tactic, my heart rate jumps up considerably. I find myself having to control my breathing. Rocky Rook also uncovered this piece of medical research (PDF file), entitled: Hopelessness Is Associated With Decreased Heart Rate Variability During Championship Chess Games. The title was pretty much all I understood of it, but the message basically seems to be if you find yourself heading toward a coma during a game, you're going to lose. But if you think you're at risk of a heart attack, you're going to win. Mild palpitations predict a draw. Kasparov has come to London, to explain How Life Imitates Chess. Your chance to lose money to him in real life - much as you would have lost pieces to him at the board - occurs at a book signing tomorrow, from 5.30pm in the Waterstones on Piccadilly. Chess & Life? Maybe, maybe not. I've always thought this chess variant was a clear, if limited, imitation of the warping of space and time predicted by Einstein's Theory of General Relativity, but that's as far as I'm willing to go. Did life imitate chess in that one? If so - the moral is anti-materialistic: chuck half your stuff away, and then end up winning. Perhaps I should read the book. And then, throw it out . . . This problem is attributed to Tartakowever. Mate in one. How hard can it be?